Well, yesterday and today I decided to help out at a place I work at, and that's ... it's made it difficult for me to stay on schedule. I helped run an inventory and clean up, and tis is work that is very different from my regular job. On my feet all day. I have penciled a new page this week, and I think it looks nice. I've got a slim chance of completing the inks on Saturday. If I can complete the inks on Saturday then I can get the colors and the dialog balloons on Sunday. I don't like it when I have to ink and color on the same day, but if I have to, then I guess I have to. Making decisions about my life and what I want to do. I believe it'd be optimal just to work on my comic. That I would like very much to try, to simply work on my comic and attempt to get one issue completed each month. Would I burn out? Would I say "Screw this comics horse puckey, I'm spending all my free time jerking it from here on out!"? And another thing about bad comics. I read a collection of Marvel's Runaways. I suspected it would be bad, but there's some interest for me in finding out what makes it bad. Again, it was the characters. The plot is these are all children of a super-villain group, and the children want to be good superheroes. However, the guy who's writing it just had a one-dimensional view of everyone. They alwasys behaved according to type, in each issue. There was the dumb guy, and then the smart goth girl leader would make fun of the dumb guy, and then there was the blandest skrull character ever written, and then he went off into space and ... there were characters in this team that were so bland I didn't even bother remembering their names. Right, one of them had a pet raptor dinosaur. That's kind of an interesting idea, but no effort was put into bestowing it with any characteristics whatsoever. It was written as if it was a dog. Not even a friendly dog, or a dog with any personality. It looked at whoever said its name, which was once maybe every four or five issues, but it never did anything, like tear people apart or whatever a dinosaur could do. That would have been interesting to write, considering how small dinosaur brains were; you could write it like a cockatoo, or like a chicken, or like an iguana. Instead, the writer had no idea what to do with it, and the only interaction the characters had with it was in the one issue where it was killed off for cheap emotional effect. Please make the characters interesting; please tell me why they hang out. No, not only why they hang out, but if they hate each other, like each other, and why. If you don't, it's just blando bland. Stop doing that. Published on October 7, 2016 by Sam Battin. 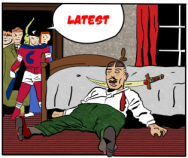 The police sergeant tips his hat and answers Crimebuster's question: "Well, the lacrosse team has been nothing but cooperative with us so far. Let's go find out." We pull back the camera and see three other policemen watching the interaction between their fellow policeman and this costumed crimefighter. One policeman says "What's with the caped crudite? Why does he rate special treatment?" Another officer responds "I dunno, but the sarge seems to know him pretty good." We return to Crimebuster and his discussion with the policeman. The Sarge's radio goes off, and he says "Scuse me, Crimebuster, I have to get this." Crimebuster smiles and replies "Sure thing, officer! I ought to put the hose back in my car and get Squeeks!" Crimebuster walks by the three policemen that were earlier commenting on him. Crimebuster waves to them in a friendly manner and says "Just wanted to say thanks, officers! Please let me know if I can help out!" We see the three policemen - they are stunned into mute, dumbfounded looks by Crimebuster's odd behavior and demeanor.